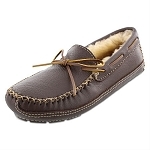 Moccasins make delightfully comfortable shoes – but did you know they also make for delightfully comfortable slippers as well? 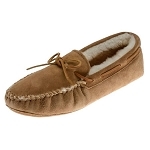 Never choose between your moccasins or slippers again! 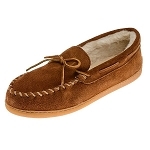 Merely purchase a pair of Minnetonka men’s slippers and you’ll be wondering why you had never owned a pair before. 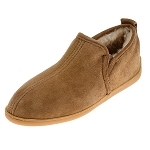 No matter the size of your foot, you will always find a pair of slippers that fit you perfectly with our selection of medium or wide fit slippers. Soft sole or hard sole are available in our slippers so that you can always have whichever you prefer for an almost-customized feel. 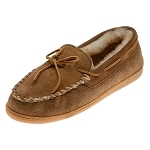 Moccasin Direct’s sheepskin ankle boot slippers are bound to surprise you with just how comfortable and soft they are – you’ll never want to take them off! It’s the same no matter which pair that you finally decide to purchase at a great price. 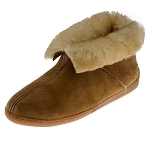 With great durability, you’ll get longevity out of these slippers that are almost impossible to find elsewhere.